Got a call over the weekend from the Panerai Boutique here in Taipei. Was it THE call? Nope, it was for the strap I ordered. It finally arrived. Which strap you ask? 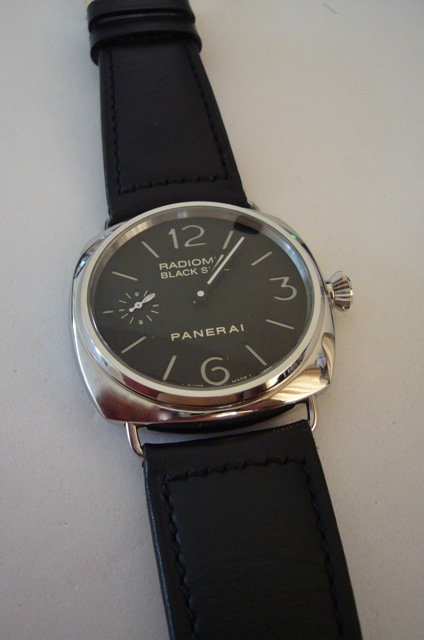 It is the Jules Verne strap for the PAM00183 Radiomir Blackseal. 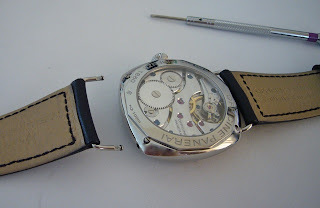 First a bit about the Jules Verne strap. The strap first came out in 2005 with the Jules Verne Sealand, reference PAM00216. The strap is unique in that it featured a nubuck alligator hide. 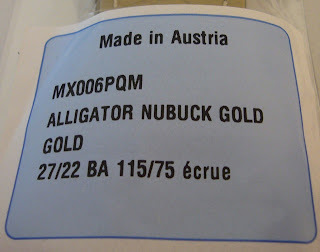 From my readings, Nubuck is a process where the hide is buffed on the grain side. The end result is a velvet like finish. It is similar to suede in finish. 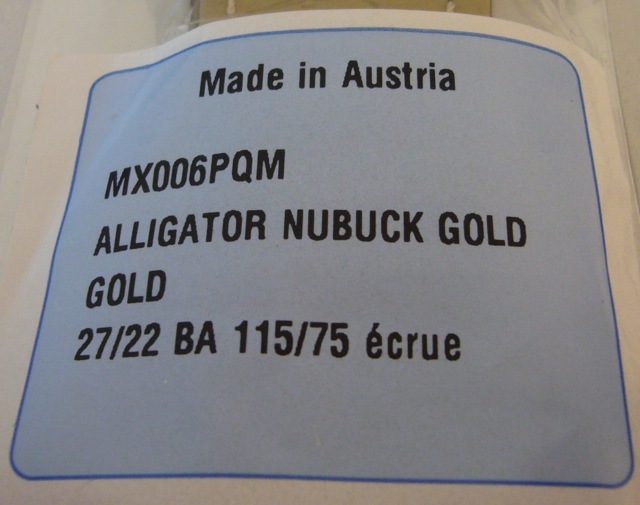 Anyway the reference for the strap is MX006PQM Alligator Nubuck Gold, which is 27/22 for a thumbnail buckle. There is a black version as well. I prefer the gold version as you can see the grain better. 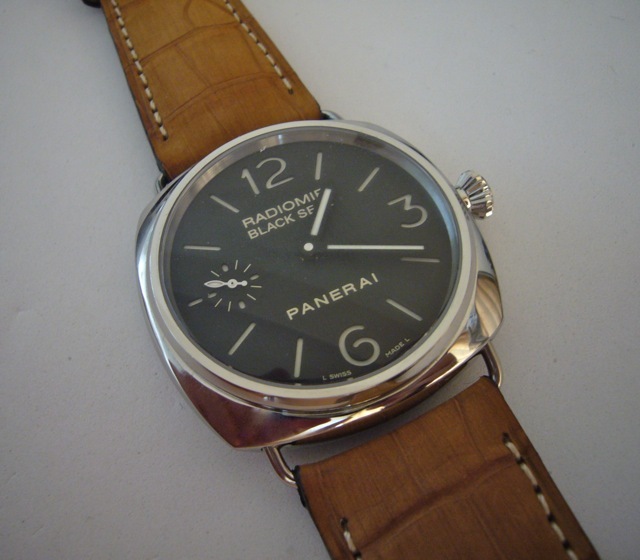 The PAM00183 with the black calf leather strap. 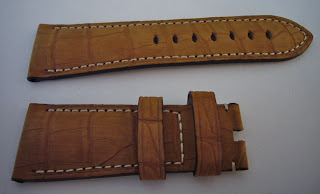 The Jules Verne (JV) strap. I love it. The back. It is a well made strap. Make sure you have the right tools. 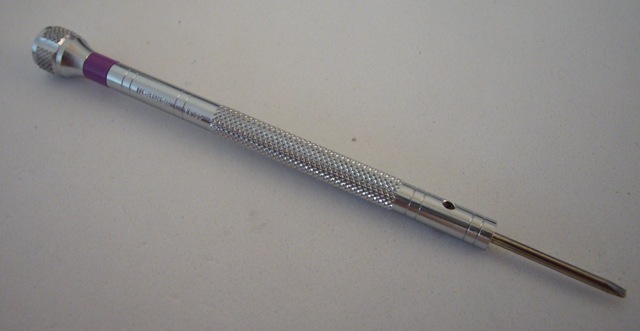 In this case it is the purple band screwdriver. I leave the screws in the case. Pull the old strap out in an upward direction. 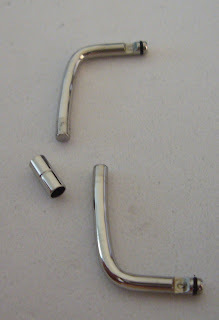 Do the opposite when installing the strap.Also don't forget to lubricate the gaskets at the ends of the wire lugs. 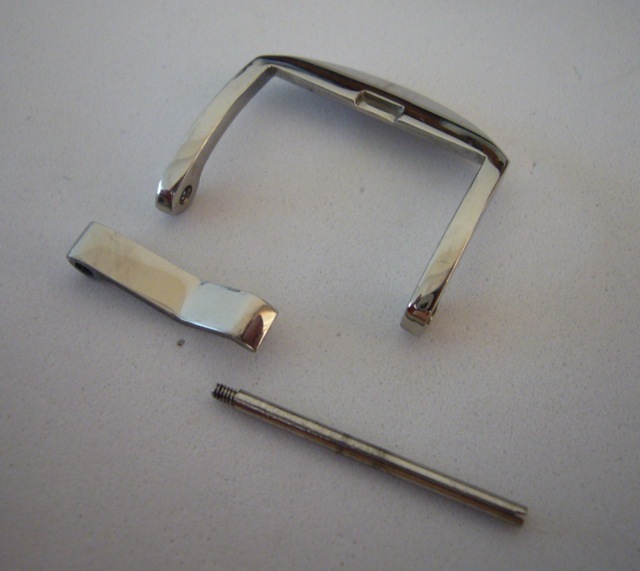 The 3 parts that make up the wire buckle of the Radiomir watch. The center piece holds it in place (lock). 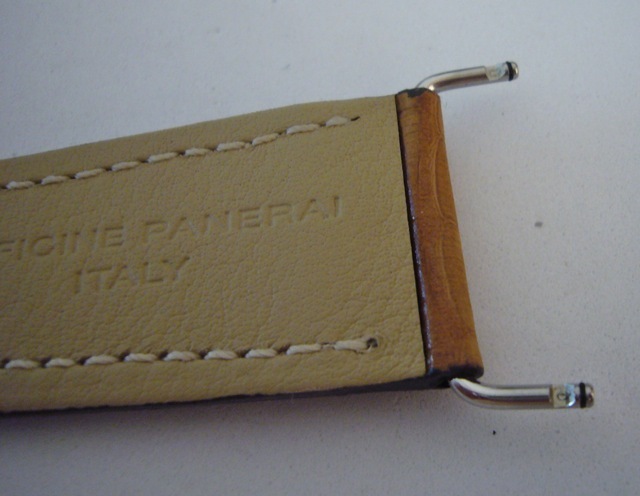 This is how it looks like inside the strap. 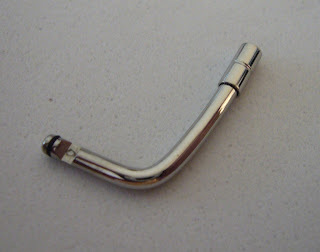 The center piece 'locks' the two ends in place. Oh before I forget, you use one end of the wife buckle to guide the center piece into the strap. The thumb nail buckle. 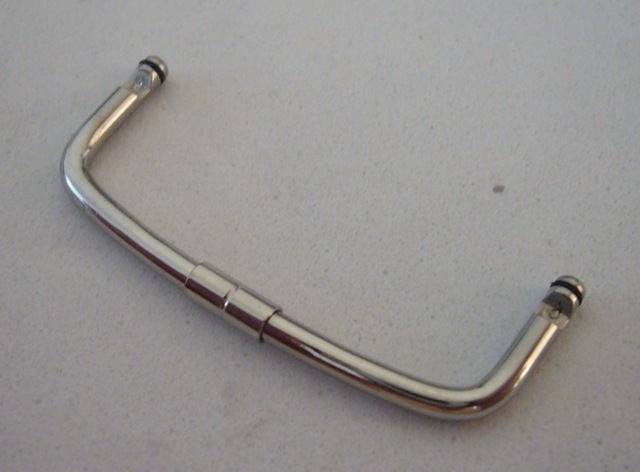 Please note it is not an original buckle. The change done. The watch looks complete different. I think it looks brighter. I am indeed happy. Should have done this earlier. On a side note, if you are looking for straps for your Panerai, do visit the Panerai Boutique at the Taipei 101. They have a good selection of straps available and ready stock. 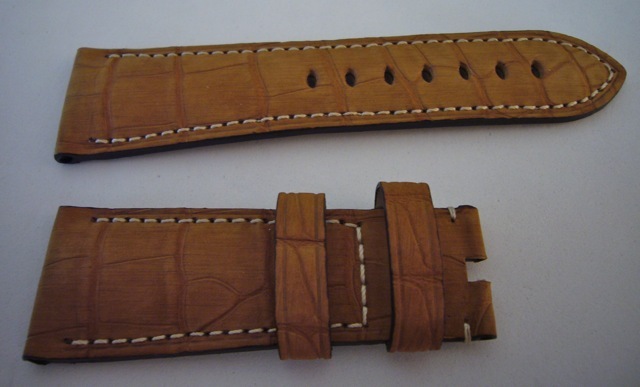 I am already thinking of getting another JV strap, but this time it is the 24 mm for the Luminor watches that I have. The best part is that they have the Riva strap which I like. They have both the brown and black version. However it is for the folding buckle and not tang buckle. They also have the MX straps with sewn in Pre-V buckle in stock. 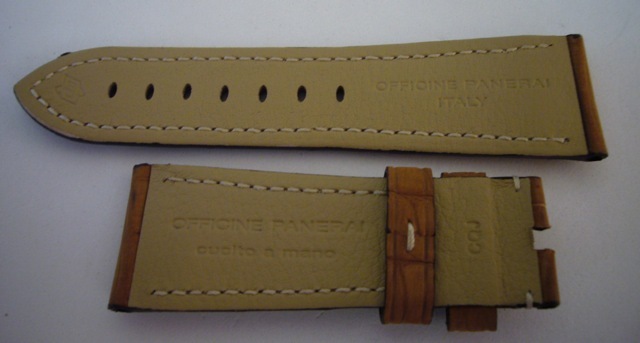 They also have the carbon fibre finish leather strap in stock. The Carbon fibre finish leather strap. What do you use to lubricate the rubber? WD-40? Welcome to the blog. With regards to your question, no I don't think WD-40 is the right lubricant for the o-rings. Basically I use watchmaker silicon grease or O-Ring silicon grease. You can get them at any good watch tool and parts supplier. Don't use WD-40 on o-rings!